When a Sudden Cardiac Arrest (SCA) occurs and happens out of a hospital your chance of survival is thought to be fewer than 1 in 10 according to the UK Resuscitation Council. The ambulance service attend around 30,000 cases alone in England, and that’s just England, so by adding Wales, Scotland, and Northern Ireland it will be significantly higher. We have seen a noticeable increase in the members of the public wanting to learn CPR and how to use an AED (defibrillator) in the last 12 months because they want to be able to make a difference in an emergency if someone is having a bad day. Many businesses have AEDs on their sites too today and they too have had their doubts to which are similar to the public, we share this in another blog we wrote AED and Business. In the majority of cases of Sudden Cardiac Arrest its caused by an abnormality in the hearts electrical rhythm, this is known as ventricular fibrillation. This happens when electrical impulses that normally control a natural heart rhythm go chaotic and uncoordinated and then the heart stops beating and the circulation of blood stops too. For any chance of survival, a defibrillation needs to be carried out within the first few minutes. Defibrillation uses a high energy shock to stop the chaotic heart rhythm and restore normal heart rhythm which in turn gets the circulation moving again. AEDs are becoming more commonplace in public areas. If you can get an AED to someone who is having a Sudden Cardiac Arrest within the first 3 minutes they have around 70% survival rate and for every minute that one is not available it is thought the survival rate drops by another 10%. Doing CPR will bide that person some time whilst an AED if one is available to arrive at the scene so you can see why having an AED makes a big difference to someone who requires it to get the heart back into normal rhythm. In the UK AEDs (defibrillators) are becoming more commonplace in public areas, these are kept in slightly heated cabinets because if they are in an exposed position to the elements especially during the winter months this will protect the lithium battery from degrading so quickly because of the cold, cabinets are kept around 5ºC. These are fitted into lockable cabinets to prevent theft and tampering, public AEDs are on a database and ambulance control will tell the person where the nearest one is and also give the keylock code so it can be retrieved. Are AEDs simple to use? AEDs are designed to be used safely by any members of the public whilst waiting for the ambulance to arrive. There are many misconceptions that they can cause more harm than good and so reluctance to use sets in when in reality using an AED and performing CPR on a casualty the likelihood of causing harm is very small indeed. Nevertheless, the concerns are there and so reluctance to use an AED set in to resuscitate someone who they suspect of having a Sudden Cardiac Arrest because they feel a legal claim could be brought against them if its thought the rescuer attempts to resuscitate caused harm. At this date in time, there have been no reported successful claims to this effect, but this still does not allay the fears of the rescuer being pursued by a legal claim. How fast do you need to use an AED? 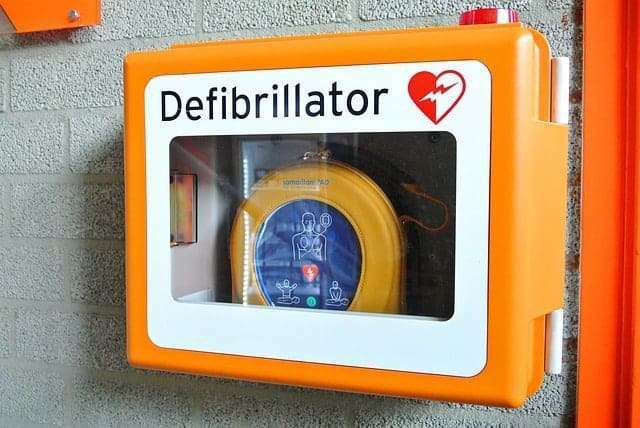 It is said that if an AED is used within the first 3 minutes of a Sudden Cardiac Arrest that person has a survival rate of around 70% and this falls away by around 10% for every minute that defibrillation is delayed. Very rarely do the emergency services attend quickly enough to perform defibrillation hence the staggering death rate of around 60,000 people a year in the United Kingdom. So if a member of the public uses an AED early enough this could save someone’s life. AEDs have improved substantially since they first started appearing in public places they are very reliable and will not shock if one is not required. Once switched on the AED will guide the rescuer by voice prompts through the setup procedure and use. Where can you learn how to use an AED? All work based first aid training courses have mandatory training on using an AED since 2016, also many providers have standalone courses on how to use an AED too. We have 1 trainer AED between 2 people and we teach people on every course we do because we feel its important that people are not scared to use these amazing machines that can save a life if used early enough. With over 30,000 lives lost in England alone with Sudden Cardiac Arrest, an AED can make all the difference to someone who is having a really bad day. You do NOT need professional training to use an AED because they are designed to be used by anyone, you could really make that difference, wouldn’t you like someone to give you every chance of survival if it was you who was having a bad day.